A polymer modified asphalt emulsion based driveway Filler and sealer designed to beautify and protect asphalt pavement surfaces. Fortified with sand for added filling, slip resistance, and durability. 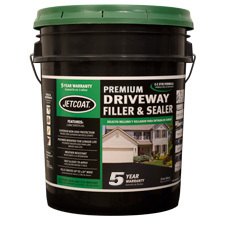 JETCOAT Premium Driveway Filler & Sealer is packaged ready to use. Stir sealer to a uniform consistency and continue to stir throughout application. With pavement still damp, apply a uniform coat of sealer, being sure to avoid heavy or uneven application which may result in cracking or tracking. A second coat should be applied after the first coat has dried “to the touch” or within 24 hours at stated coverage rate. A rubber squeegee or brush is recommended for application. Depending on pavement porosity, coverage will vary from 250-350 sq. ft. per pail. 25745 4.75 gal. Pail 57.5 lbs.